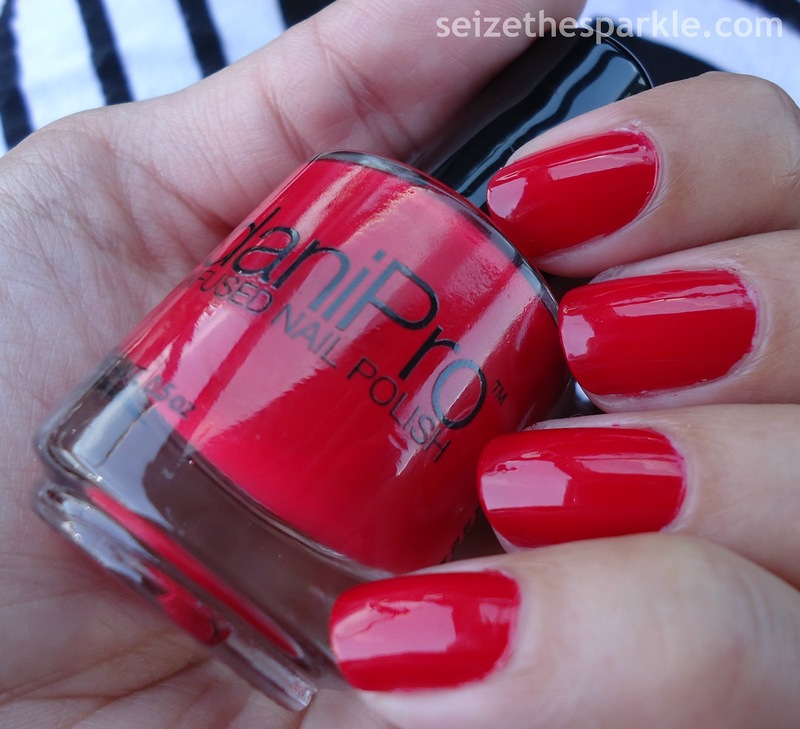 This is the last of the daniPro polishes I received to review, and it was definitely my favorite. Pink is by far my favorite color of nail polish, and hot pinks like this... well, I have so many variations and I can't resist adding new ones to my stash. In case you missed my reviews of First Kiss and Forever Girl, daniPro polishes were created by Manhattan Podiatrist Dr. Gary Evans. The formula is 5-free and the polishes are recognized by the American Podiatric Medical Association to promote good foot health. Before painting, I thought that My Girl would be pretty opaque, but I was pleasantly surprised to find it was another crelly! Of course, that meant painting a few more coats to get what you see in the photos, but it was definitely worth it. Crelly finishes are probably my second favorite after jellies, but when they're in my favorite shade of hot pink? Swoooooooon! I really love this shade, it's a perfect slightly blue-toned pink that, like the others in this collection, should flatter every skin tone! Gotta love that!!! daniPro polishes can be purchased at select podiatrist offices around the world, or online here. *provided by PR for review. All thoughts, views, and opinions are my own. In case you missed my review of First Kiss, daniPro polishes were created by Manhattan Podiatrist Dr. Gary Evans. The formula is 5-free and the polishes are recognized by the American Podiatric Medical Association to promote good foot health. 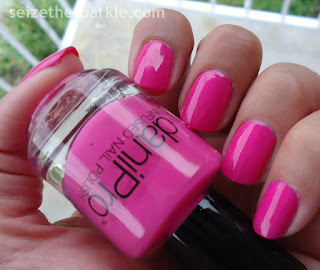 Forever Pink is more of a crelly polish, so I had to use 5 coats to build up to the opacity you see in the pictures. Because of the sheer formula, it was a little patchy until about the 4th coat. 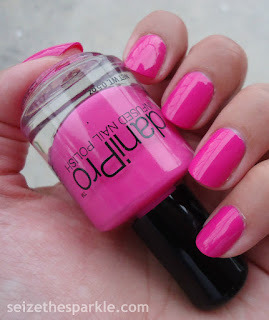 But once this polish is opaque, it's a really gorgeous shade of pink and the crelly finish really made it shine. I've been into lighter shades on my toes lately, so I could easily see taking this along the next time I go for a pedicure! It's been a little while since I reviewed a polish via press sample here. This brand was a little too interesting to pass up, though! According to the press release I was sent, daniPro polishes were created by Manhattan Podiatrist Dr. Gary Evans. The polish was even recognized by the American Podiatric Medical Association to promote good foot health. daniPro polish features a 5-free formula that does NOT contain formaldehyde, formaldehyde resin, DBP, TPHP, or Toluene. It is also infused with something called Undecylcenic acid, which is commonly an active ingredient in medications for skin infections, but it hasn't yet been proven to be effective in treating fungus on the nails. Chemical analysis aside, this stuff didn't smell nearly as potent as some polishes, which is always refreshing. Formula-wise, it was pretty standard, not too thin and not too thick. First Kiss had great pigmentation. I probably could've gotten away with two coats, but three coats is just how I roll. I'm not the biggest red polish fan, but this shade is pretty universal. I imagine it would look great on any skin tone! Looking back, I can honestly say that my seriotype game has come far since I first learned the method. One of the things that took me a while to master was the balance of nail polish finishes. While seriotypes made exclusively with creme polishes look cool, those made with a combination of different finishes really pop. There's more depth involved when you layer a metallic over a jelly neon and then add in some shimmer and glitter. For these nails, I started out with 3 coats of Violet Vibes on my nails. Oddly enough, when I took these photos, I think I grabbed my bottle of Plu-rple by mistake. On top of that, I dabbed on a coating of Konstellation to darken things up a bit. Then came a coat of Get in Line followed by Leggy Legend. After that, a coating of Autumn People and some more Leggy Legend and Get in Line around the edges of my nails. I finished everything off with 2 coats of clear and a coat of Seche Vite for tons of shine. I'm really stuck on copper, turquoise, and glitter in my manicures right now. I've done a bunch of different seriotypes in the past few weeks, but they all seem to fall back on that combination. Thankfully, I did put a bunch of nail polish away today, so hopefully that means a varied color selection as I search through my drawers for shades. At any rate, Happy Friday! Hope you have a great one!!! We're going to skip that whole part where we talk about how it's been a while, because well, it's been a really long while. I'm still trying to work out how to make room for blogging and juggle everything else, and it's definitely been a challenge. But know that I am working on it, and I do really, really miss it. This place has been my Quantum of Solace for a long time, and I'm not planning on letting it go anytime soon. That being said... for this week's prompt, I was happily surprised when I pulled HARD CANDY. This is probably one of the most iconic brands of nail polish, and it's certainly gone through it's own number of changes throughout the years. Who didn't want to own a bottle of Sky once they saw it on Alicia Silverstone's nails way back in the 90's? Last year, Hard Candy celebrated their 20th anniversary by bringing back some of their most iconic shades. The collection was a mix of five original shades and three new ones. I managed to acquire six of them, two of which I used in this seriotype. Though you wouldn't know it thanks to my lack of posting, I have still been painting my nails on a regular basis. Lately, I've been wearing a lot of bright and bold color combinations, so I decided to switch it up for this one. Softer and lighter was definitely the palette cleanser I needed! When I went to pull Coconut out of my helmer, I was a bit surprised that the plastic shrink wrap was still on both bottles. (I have backups of the original 5 shades.) I could've sworn that I wore Coconut before. O.o Slightly mystified, I removed the wrapper and painted on three coats. It's a white polish with a very fine pink shimmer. It wasn't the smoothest of formulas, but that's pretty typical for a white polish. I used three coats, letting each one sit for two or three minutes before painting over them. I used a simple saran wrap blotting technique, my preferred method for seriotyping. First, I painted on a thin coat of Beetle and blotted it with saran wrap. That was followed by one coat of Mr. Wrong, Girlie, and a 2nd coat of Beetle, all followed by a quick blot with the saran wrap. Two coats of clear meshed everything together nicely. One coat of Seche Vite and I was off to bed. This layering was pretty cool and definitely has me channeling a lot of old school vibes. Makes me a little nostalgic for the days of the Just Nails collection from Hard Candy, when polishes like Beetle and Mr. Wrong were standard fare! While I do like and own some of their newer polishes, the ones in the square bottles (especially the ones with the rings!) will always hold a special place in my heart! For the past two weeks, I've been obsessively using Leggy Legend and Get in Line together. Oh, and I've been putting just a smidge of Autumn People on top, because I still can't quit that polish. I'm not sure why I didn't buy a backup or five. Get in Line is a sheer turquoise shimmer that was just made for layering. It's subtle at some angles, but when the flash catches, it's strong. Combine that with the super pigmented metallic copper of Leggy Legend, and it's all over. What's especially cool is the fact that the combo works well over light and dark colors, and looks a little different (but still fabulous!) over each! The WHITE polish I used for my base is none other than Kovet from SinfulShine. Part of the Kylie Collection, it's a white crelly with turquoise shimmer. If you're on the lookout, be wary, there is another white polish with gold shimmer in this collection called Koko-Nuts. I almost passed on Kovet until I picked it up and saw the flash. I had to have it! I know I've said it before, but when it comes to SinfulColors, shimmer is their thing. They put out a lot of interesting combinations on a consistent basis. Some of the colors from the Trend Matters Collection are just gorgeous. For this seriotype, I started out with 3 coats of Kovet. I did wait a few minutes in between each coat to help with streaking. Not exactly necessary considering I was planning to cover most of it anyway, but still. After that, I painted on Get in Line and dabbed randomly with saran wrap. I followed up with a coat of Leggy Legend and Autumn People, dabbing each immediately after putting it on my nails. Two coats of clear coat helped mesh all of that together and blur the edges a bit. Finally, I locked everything in with a coat of Seche Vite. All in all, I really like how this seriotype turned out. It has a little bit of a marble effect to it, which is pretty cool. I'm definitely keeping this on for at least another day. As far as the weekend goes, we're not going to talk about the fact that it's been raining since March. We're just not. I'm planning on a relatively chill weekend. Hope yours is too! After a little bit of a cold spell brought a whole lot of rain, well, the end of this week was in dire need of some sparkles. This whole April showers thing is great and everything, but I'm ready for all the May flowers! So here's a little bit of a GLITTERBOMB to cap off the last Friday in April. Earlier this week, I finally ordered two polishes that I've been wanting for a while. They're both ultra chrome flakies from ILNP. Kaleidoscope is described as purple, magenta, green, gold, and turquoise flakies, while Ferris Wheel contains a mix of green, gold, blue, red, purple, and pink. Is it really any surprise that I had to layer them together? But what color to layer them over? That's always a difficult choice. Especially for the first time. So, rather than choose something really dark or a light pastel, I went middle of the road with a nice bright blue. But not just any bright blue. True Kolor is a new SinfulShine polish, part of the King Kylie collection. If you missed out on Revlon Royal, this is definitely dupe-worthy. But it does still have that smell. After two coats of True Kolor, I decided that I needed a little bit of glitter and shimmer for the background. Cosmic Microwave Sky was part of my March mystery bag from Rainbow Honey. It's a green leaning blue with all sorts of blue-green sparkles and my favorite, square glitter! That created a great base for the flakies to do their magic. Originally, I had planned to only use Ferris Wheel and Kaleidoscope. Ferris Wheel leans a bit green, while Kaleidoscope is mainly magenta/purple. I felt like the layering needed a little more gold, so I added Gumdrop Rooftop from Pahlish. One more coat of Kaleidoscope and I was ready to seal it all off with SinfulColors clear and a coat of Seche Vite. I really love how this layering turned out. Sometimes, you purchase a polish and it shows up and it's just not what you expected. Kaleidoscope and Ferris Wheel are definitely NOT those kinds of polishes! So, yeah. Safe to say I'll be wearing this for at least another day. In other news, I fiiiiiinally managed to find a replacement for my Old Navy utility vest, so I'm pretty excited about that. This one has a hood, which is never a bad thing, at least in my book. Tomorrow we're taking Peanut shopping for purple sneakers, so wish us luck on that endeavor. I tried to scout some out today and came up empty-handed. Or should I say, footed? I'm not really sure what else I'm looking for tomorrow, but it's a wolfpack weekend, and in my book, those are the very best kinds of weekends. Hope you have a happy weekend too! You know, every now and I then I do pick prompts that work perfectly with a new polish I've just purchased. This time, though... I did pick two prompts to choose between. One of those happened to be EARTH, so I went with that, consider that today is Earth Day. I've been wanting to do a seriotype for a while now, and this prompt was the perfect chance. I wanted my nails to look like the view of EARTH from space, and I've gotta say... I think I got pretty close! I started out with Navy I Do from SinfulColors. It was practically a one-coater, but I used two coats so I could wrap my tips. I figured that if I wanted the green to show up, I should probably put some white down to really make it pop. Using saran wrap, I dabbed on random blotches of Kovet followed by Snow Me White. From there, I dabbed Garden Party on randomly, followed by a few splotches of Leggy Legend. I painted on one coat of Gumdrop Rooftop and follow that with a little more Navy I Do to balance out some overly green areas. Then, I added a little more Leggy Legend on a few nails. After that, it was the typical coat of SinfulColors clear and a coat of Seche Vite! I'm really happy with how this manicure turned out! Like I said, I've been itching to do a seriotype for a little while now, and this really was the perfect opportunity. Definitely gonna keep these on for at least another day! Happy Friday guys! How good does it feel that the weekend is here and the weather is fiiiiinally starting to warm up? Sooooo good, right? The prompt I pulled for this edition of Fishbowl Friday was SIMPLE. Pretty open ended, but I settled in on just one nail polish in my go-to favorite color. Pink. I know I have said it at least a few dozen times before, but I'm pretty sure this time I mean it. I have found the most perfect hot pink nail polish. Okay, well technically speaking, it actually found me. Le Marguerite Rose was one of the polishes in my April mini mystery bag from Rainbow Honey. I picked the prompt and opened up the bag and knew that I had to use it immediately. When it comes to hot pink, I am typically drawn to more blue-toned pinks. But, if they're too cool, they really don't go well with my skin tone. At the same time, I like warmer toned pinks, but if they're too warm, they register as more of a red, which I'm not as into. Somehow, and I'm not exactly sure how, Rainbow Honey managed to make a pink that's practically neutral. It really walks the line. But what really tops it all off is a slightly jelly finish that gives it incredible shine. Hey guys! I know it's been a little while since I last posted, and I'm sorry about that. I want to get back to blogging more regularly, I just need to figure out a better way to make it happen! Things are good, though. The new job is great, Mr. Sparkle and Sparklegirl are awesome... life is definitely busy, but full and wonderful at the same time, you know? Enough about me, though... today, I want to show you a polish from SinfulShine, a brand that I've been wearing a lot lately. This particular shade, Too Cool For Pool, well, I've worn it twice in the past month. That's how much I really like it! Back when the SinfulShine line first debuted at Walgreens, I picked up a few shades. One of the most noted at the time was Prosecco. There was quite a bit of buzz in the blogosphere about that one at the time! After my first initial purchases, I didn't really gravitate towards the line again. Last summer, SinfulShine came out with a new gel topcoat and several new shades in the SinfulShine line. Shades could be purchased separately, or with the special new topcoat. 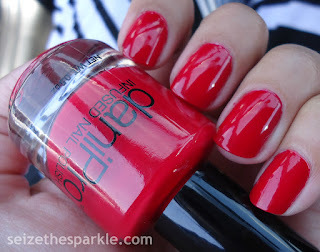 My first foray back into the SinfulShine line was with this polish, Too Cool For Pool. I also bought a bottle of the new gel topcoat. I think that was around October or November of last year. To be honest, both of the bottles sat on my desk for quite some time. Initially, I was planning on reviewing this polish with the use of the gel topcoat. So, I did what I usually do and read a few other reviews to find out more about the claims. Unlike my past dealings with some of the Limited Edition SinfulColors polishes, I didn't have too much information about the new SinfulShine line. I had heard that the polishes had been reformulated to work with the new gel topcoat. Then, I read that only the gel topcoat was new, and the new SinfulShine colors still had the same formula as Prosecco. Naturally, I was a little confused. So, I sent out an email asking for clarification. When I didn't hear back, I thought that I would use this polish as a regular nail polish and see how that worked out. Using one coat of ridge filler as my base, I followed with four coats of Too Cool For Pool to reach opacity. There's a sort of jelly quality to the finish of this shade, and I still had patchiness at 3 coats. I topped everything off with one coat of clear and a coat of Seche Vite, just like my regular manicures. I'm pretty sure that the newer SinfulShine polishes are just the same as the old ones. Now, I can't say that for sure, but I've worn quite a few shades just like this one to similar effect. No change in drying time, no weird wrinkling or bubbles to be found. I can't really say that the manicure lasts any longer than regular polish, and I know that's where the gel topcoat makes a difference. But I've been happy with the wear that I get. Typically, it's about 2 days, but every now and then I'll squeeze in a third day. This shade in particular drew me in because it's a gorgeous shade for Spring. It's a darker version of Serenity, one of the Pantone colors of the year, so it's still on-trend but not terribly overreaching. As a bonus, it's packed with a duochrome shimmer that flashes from gold to pink. I know that I dubbed 2015 as the year of contrasting shimmer, but I'm starting to think that guess was premature. If there's anything I would say SinfulColors specializes in, it's shimmer of every kind. It's nice to see that translating over to the SinfulShine line as well! I have a few more SinfulShine polishes to show you, most of which are from the King Kylie Collection. That particular collection seems to be a little more widely available than the recent Limited Editions from SinfulColors. So, stay tuned for those. As a whole, I feel like there are fewer releases happening, so that has been kind of frustrating lately. I've been working on adjusting to my new schedule and a longer commute, so I'm still sorting out what I have time for on the weekdays! For those of you hanging in there with me, I really do appreciate it! Hope you're all having a wonderful weekend! Can I get a Happy Friday? It's a little hard to believe that Spring is just hours away from arriving! I don't know about you, but I'm ready for warmer weather. Sooooo ready. When I picked the prompt last night and drew ORLY, it was either go bright or pastel. Bright won, and then I just had to add in a little sparkle for good measure. How awesome is this layering? Part of me doesn't want to take it off and part of me wants to build a seriotype on top of it. Difficult choices, huh? I can't say that I have an overwhelming amount of ORLY polishes. But I do love most of the ones I have. Out of all the mainstream brands, they're one of the trendiest. I feel like they do a pretty good job of pushing the envelope with colors and finishes. On The Edge was part of Orly's Adrenaline Rush Collection for Summer 2015. Out of all the shades, this one definitely stood out. It's a really gorgeous statement polish. We all know that no Seize the Sparkle look would really be complete without a healthy dose of sparkle, right? So, I added a coat of Autumn People from Pahlish. I really like how the gold and pink multichrome contrast with the purple. And then some of the duochrome flakes flash green and it's all over. Lurve. It.